Celebrate your child’s Birthday with a present which will help to start a lifetime habit of happy peaceful productive practice. Open the gateway to a better future. ✓ Better brain and nervous system: Practising actually strengthens the neural circuits. ✓ Cooperation: You will learn respect teachers and peers through making music together during your music practice. ✓ Dealing with frustration by learning problem solving skills: Another ever present feature of music practice. ✓ Enhanced coordination: Music practice teaches fine motor skills and good hand eye coordination. ✓ Focus and concentration and the ability to listen and imitate: Focussing on several things at the same time; playing a musical instrument is complicated and requires an unusual amount of focus. This is why you practice music. ✓ Goal setting: Managing a project effectively and the ability to meet deadlines is taught in music practice by getting pieces ready for performance. ✓ Memory skills: If you are a Suzuki student, you will know what this is all about. ✓ Observation: Learning to target and improve on weaknesses is essential, if you want to improve your ability. ✓ Patience: Practicing an instrument teaches you to stay more calm and centered when you are doing something complicated. ✓ Perseverance/Endurance: Practice teaches you that you need to keep working if you want to get results from your music practice. ✓ Positive experiences: If you imprint the golden moments of learning and playing music on your mind, you will build a treasure chest of good memories to help you through hard times. ✓ Problem Solving: Music practice teaches you to break any large problems encountered in learning into small achievable steps. ✓ Self-evaluation: This is an essential skill which a musician needs to learn. ✓ Self expression: You will develop your unique voice. ✓ Self worth: This is linked linked to undertaking and successfully reaching targets. ✓ Sensitivity to Feeling & Emotions: This is what making music is all about. ✓ Values: Music practice teach you to learn to strive for mastery. ✓ Widen horizons: As you grow through music practice you will learn to recognize possibilities and opportunities develop an “I can do it” mindset. Start your child on the road to excellence. 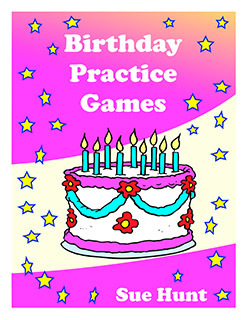 Give your child this set of 6 Birthday Practice Games. It’s time to get started with the first of many very special fun practice sessions. This appealing set of downloadable Birthday Practice Games can be the start of a life time habit of good practice.